Congratulations to Todd Jardine's 'C.J. 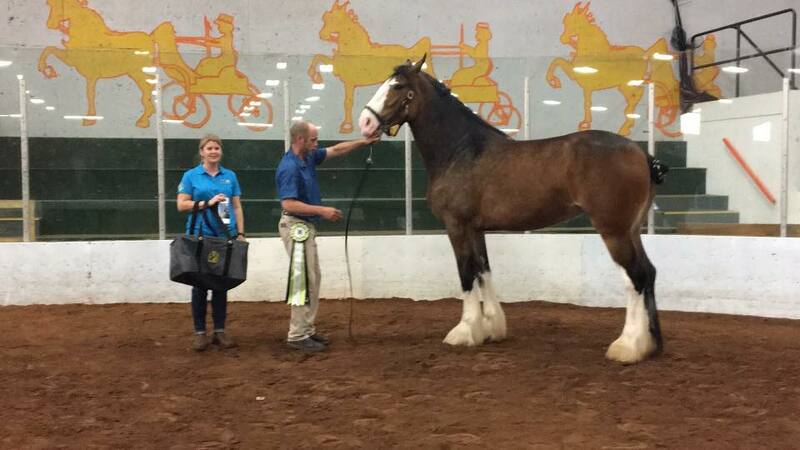 Venus' Judges Choice and Peoples Choice Ultimate Champion in the Eberglo Draft Horse Challenge 2018. Thank you for voting in the Eberglo Draft Horse Challenge People’s Choice contest. Results will be published in the Draft Horse Journal Winter Edition 2018. Your privacy is important. Email addresses will never be shared with any third party. Yes, I would like more information on how Eberglo can help my horses. Eberglo is a Liquid Vitamin & Mineral Supplement for Horses. Eberglo's all natural formula helps your horse's digestive system, which creates a healthy horse. Let Eberglo help your horse reach its genetic potential. The Eberglo Challenge Team is preparing for the 2018 Show Season, with 'Best of Show' Tote Bags, Supreme Champion Ribbons, Eberglo Product, Eberglo Coffee Mugs, Eberglo 'Rook' playing Cards (featuring 56 Eberglo Champions and High Sale Auction Horses) Do you have your Draft Horse Champion ready to Show in 2018? Winners of the 2017 Eberglo Draft Horse Challenge! We are pleased to announce Eberglo Draft Horse Challenge Ultimate Canadian Champions 2017. 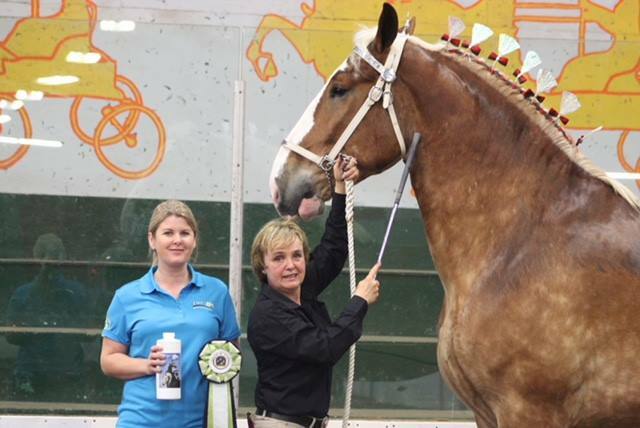 Judges Choice Ultimate Canadian Champion, Calico Isabell, Clydesdale, Mare owned by Steve Gregg & Alan Knobloch. People's Choice Ultimate Canadian Champion, Windermere's Sky is the Limit, Percheron Mare, Matt & Brenda Hornbook. Thank you to all of the participating shows, exhibitors and helpers who made this unique program a success! Eberglo Vitamin & Mineral Supplements is proud to present the first ever Eberglo Draft Horse Challenge First Peoples Choice Competition. Three Atlantic Canada Region Champions will meet the three Central Canada Region Champions in the on line Eberglo Challenge Peoples Choice Competition.Voting has ended. Voting has ended, thank you for participating! Eberglo Draft Horse Challenge People's Choice: Thank you! Thank you for voting in the first ever Eberglo Draft HOrse Challenge, People's Choice! The response has been amazing! Results will be published in the Draft Horse Journal Winter Edition 2017. Thank you for your interest in Eberglo Liquid Vitamin & Mineral Supplement for Horses. Eberglo's all natural formula helps your horse's digestive system, which creates a healthy horse. Let Eberglo help your horse reach its genetic potential. Eberglo Vitamin & Mineral Supplements is proud to present Eberglo Draft Horse Challenge, Central Region Champion Draft Horses. They have competed at five top Exhibitions across the Central Region (Ontario), and accumulated points. 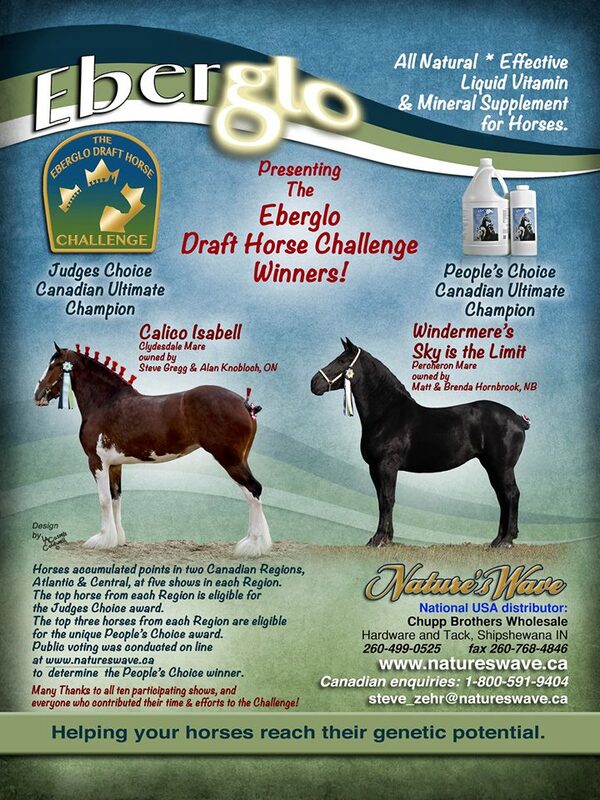 Eberglo Vitamin & Mineral Supplements is proud to present The Eberglo Draft Horse Challenge, Atlantic Region. Champion Draft Horses have competed at five top Exhibitions across the Atlantic Region (Maritimes), and accumulated points. Today we Crowned the Atlantic Region Draft Horse Champion, Reserve Champion, and Honourable Mention. 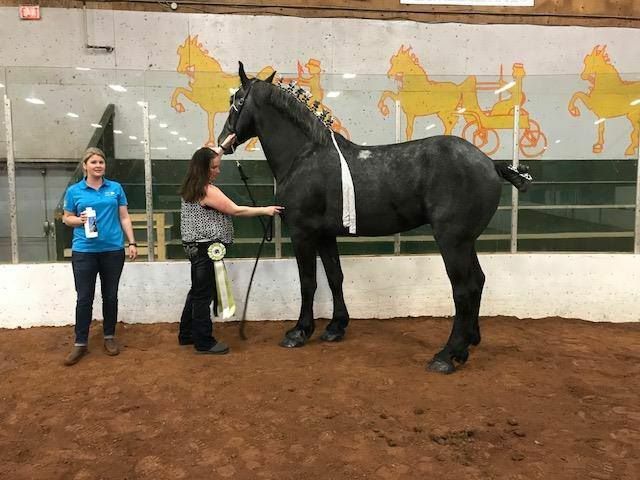 These Three Draft Horse Champions will compete in unique public online voting, with the Three Central Region Champions, in a national ‘Peoples Choice’ Contest. The fans of Canadian Draft Champions will be given the opportunity to vote for their favourite Champion. The results will be published in The Draft Horse Journal Winter Edition. Eberglo Vitamin & Mineral Supplements is proud to present EbergloChallenge, Central Region at Carp Fair, Carp Ontario Canada, Sept 22 2017. This is the third show of five shows that will decide the Central Region Eberglo Draft Horse Champion. Eberglo Vitamin & Mineral Supplements is proud to present Eberglo Challenge, Central Region at Navan Fair, Navan, Ontario, Canada, August 2017. This is the second show of five shows that will decide the Central Region Eberglo Draft Horse Champion. Eberglo Vitamin & Mineral Supplements is proud to present Eberglo Challenge, Central Region at ESSA National Draft Horse Exhibition near Barrie Ontario Canada, August 2017. This is the first show of five shows that will decide the Central Region Eberglo Draft Horse Champion. The Eberglo Draft Horse Challenge is pleased to present the new 2017 poster. The Challenge will have an Ultimate winner, chosen between the Atlantic Regional winner and the Central Regional winner. In addition, new for 2017 is a People's Choice winner to be chosen by on line voting from the top 3 horses in each region. Anyone can vote in the on line competition! The results of both will be announced in the Draft Horse Journal, Winter Issue. New Eberglo Draft Horse Challenge ribbons! The new ribbons for the Eberglo Draft Horse Challenge have arrived! They are 22" long and done in the Eberglo colours of navy, green & white. Thanks Ribbonworks.ca for doing such a great job!